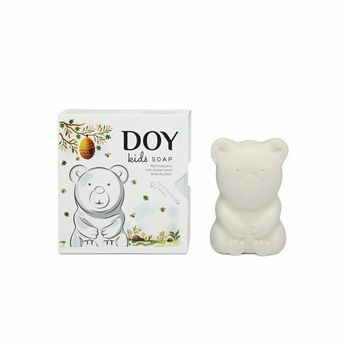 Bath time for your little ones got even more exciting with DOY Kids Teddy Bear Soap. The teddy bear is all about spreading fun and frolic, while giving your child clean and healthy skin. With its unique formulation, DOY Kids Soap aims to protect your child's sensitive skin with the infusion of Natural Milk Cream and Shea Butter, which will keep your child's skin soft, supple and well moisturized. Doy soaps cleanse skin effectively. They work up a luxurious rich lather, hydrate the skin and lock in moisture, leaving your little one with soft, supple and nourished skin all year round. Now available in fun animal shapes and characters and fresh fragrances, DOY Soaps will leave your kids skin dirt-free and fresh all day long.